Launch: - Utah Lake State Park, Provo, Utah. 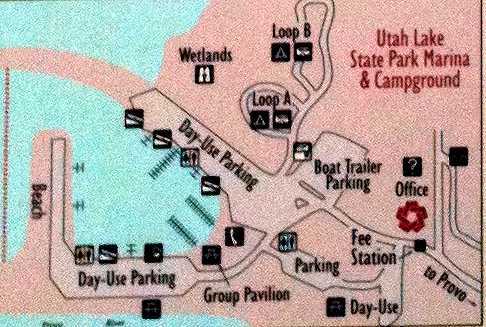 Four excellent boat ramps and visitor docks at the Park marina 5 miles west of Provo. Nearby campsites: - Walking distance from the ramps. Comments: - Utah's largest fresh water lake. A unique experience. CCThis is the tale of an ice age lake and its remnants, present-day lakes - Great Salt Lake and Utah Lake. Twenty thousand years ago ice coursed down the flanks of the lofty Wasatch Mountains that line the eastern side of Salt Lake-Provo Valley of Utah. Hundreds of cubic miles of water lay locked into ice high on the mountains. Then Earth warmed and the ice melted. Streams and rivers swollen by meltwater flowed off the mountains into the valley. 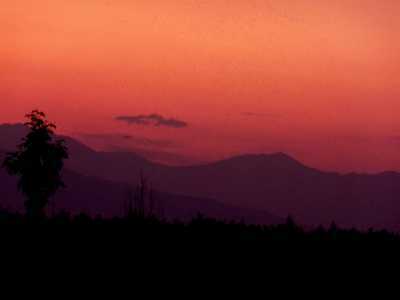 But, the water had nowhere to go - there was initially no outlet for water from the valley toward the sea. CCSlowly the valley filled with water and a huge lake filled the valley - Lake Bonneville. An alluvial fan, spreading down from the surrounding mountains at Red Rock Pass, at the far north end of the valley, formed a dam. Finally the lake reached a spillway level over the alluvial fan. Lake water flowed northerly over the spillaway and down the Snake River into the Columbia and out to the sea. CCThis equilibrium level was established about 16 thousand years ago. 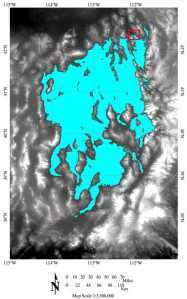 For about a thousand years all was stable, with about 19,800 square miles of lake water surface. Then, between 15 and 14 thousand years ago, there was a catastrophic failure of the alluvial dam. 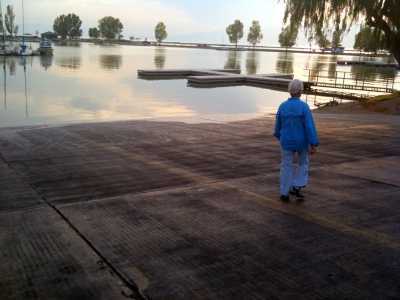 A huge flood resulted, and lake level was lowered about 350 feet. CCThe flood waters washed out the alluvial dam and reached a resistant bedrock 'dam' about 14.5 thousand years ago. 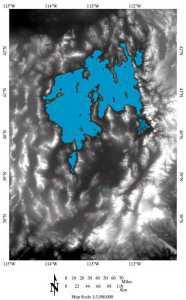 Surface area was reduced by about 5,500 square miles to 14,400 square miles. Lake level and size was stable at this level for about another thousand years. Then, with the end of the Ice Age, precipitation was greatly lowered and the lake gradually was reduced to its present size, about 4,500 square miles. CCThere is no outlet for Great Salt Lake except by evaporation. 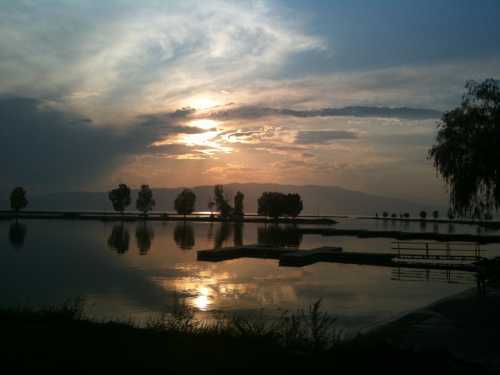 Consequently, variations in rainfall and evaporative rates cause variations in the size of the residual lake. 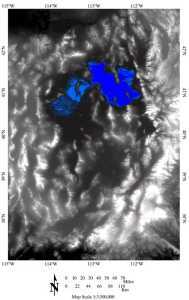 In the recent past, the lake was been shrinking due to lower precipitation. CCIn the fall of 1776, the Dominguez - Escalante party descended Spanish Fork Canyon, that slices the Wasatch Mountains giving access to Salt Lake-Provo Valley. On September 21, the exploration party climbed a small hill near the mouth of the canyon and looked down upon the large lake in a large valley to the west. One member of that party, Bernardo Y. Pacheco, later reported to the king of Spain, "This place is the most pleasant, beautiful and fertile in all New Spain." 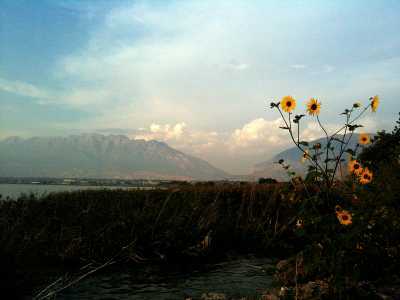 CCThe fur trade brought mountain men to the shores of Utah Lake. One, a personal hero of ours, Jedediah Smith was one of the first to name Utah Lake(in a letter in 1827). In 1844 and 1845, John C. Fremont, another personal hero, visited the lake. CC In 1933,the Civilian Conservation Corps, built the marina as a Depression work project to help aid the unemployed. CCUnlike Great Salt Lake, Utah Lake is fresh water. Why? Because it has an outlet. 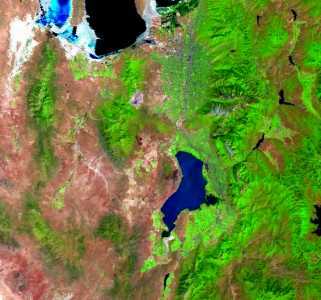 It flows northerly via the Jordan River into Great Salt Lake and consequently evaporation doesn't concentrate stagnant water to high salinity as it does in Great Salt Lake, which has no outlet. The lake covers an area of about 392 square miles, and is Utah's largest fresh water lake. 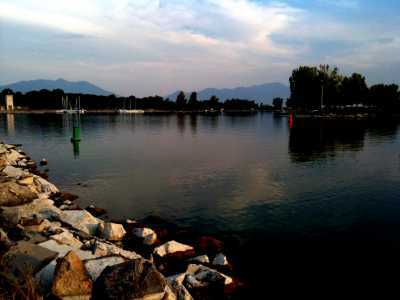 CCDespite its large surface area, the lake is shallow; it has a maximum depth of 14 feet and an average depth of about 9.4 feet! Imagine a large lake where the warning on your depth sounder would be set for 5 feet!! This shallowness allows winds to easily stir up sediments from the lake's bottom, creating turbidity in the water. There are wetlands surrounding the shoreline. These are an important stopover and nesting area for migratory birds. CCWe camped at the excellent facilities, many pull-through, and had a pleasant evening wandering the shore and enjoying the sunset. 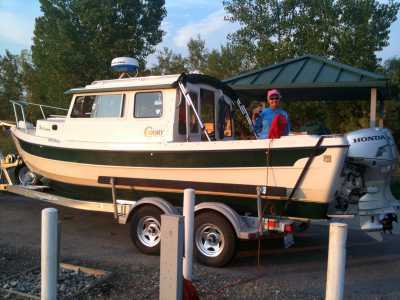 We decided, since we do not fish, that we would skip cruising on such a shallow lake.